Our Design for Manufacturing / Maintainability Engineering Process allows us to engineer standard and custom products for our customers quickly and efficiently. It helps us ensure quality, long life and durability for all of our products. For custom products, we engage our customers in every step of the process to ensure we exceed their needs. 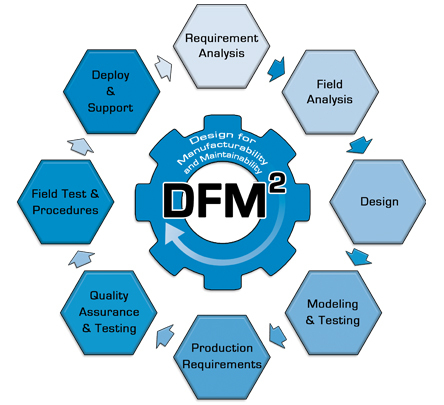 A requirement analysis is the first step in Strato’s DFM2 process. Our engineering and development teams work with our customers to define all of the requirements for the component to be developed. This includes key dimensions, strength characteristics, life-cycle requirements, etc. SolidWorks is our base platform for drawing. It includes features to support modeling, assembly layouts, animation, and provides exports to more advanced tools. It is highly compatible with other CAD systems and allows us to exchange drawings easily with our clients. Many file formats are supported to exchange drawings or models with any other engineering software. Using inputs from Solid Works, Strato engineers use the Ansys Structural Finite Element Analysis package to perform product strength evaluations, fatigue analyses, determine failure modes of a current design and then optimize a new design. Strato also designs the tooling critical to successful casting with Flow Cast, a Computational Fluid Dynamics package, to optimize part orientation and gating locations to ensure the elimination of voids. We also use SOLIDCast, a Heat Transfer and Thermodynamics package that works in concert with Flow Cast. This software provides Strato engineers the Critical Fraction Solid Time to mathematically verify riser location and eliminate shrinkage. These products are used with our vendors’ tool makers to maximize casting integrity. Modeling is a key resource in our design process. Our rapid prototyping machine can build a plastic model in less than 24 hours which can be tested in the field for form and fit. Modeling and testing allows us to design parts to fit across a wide range of cars and to make a steel sample for testing without the expense and time of permanent tooling. A sample is attainable in less than 28 days. A production requirement analysis is completed to determine the most appropriate manufacturing process for the final component. Based on the results of our sample development and testing, we select the best production process to ensure a long-lasting durable component. Strato’s investment casting process provides a number of benefits over traditional sand casting. Operationally, Strato QA has a direct operating presence at third party supplier factory sites and supports the product life cycle from the initial design review, testing through to production and complaint investigations. Parts inspection is performed at each domestic site using state-of-the-art inspection equipment and certified laboratory services for special NDT parts examinations. Prior to release of any standard or custom product, Strato conducts a comprehensive field test. Designing the field test process is a key part of our engineering process. Implementation of the field test and review of all collected data and results is the final step before release and deployment. Products are released after completion of our field test and customer approvals (for custom products). Once released, Strato continuously monitors the usage, life-cycle and other key performance indicators to ensure our products exceed our customers’ expectations. 2019 Strato © All rights reserved.